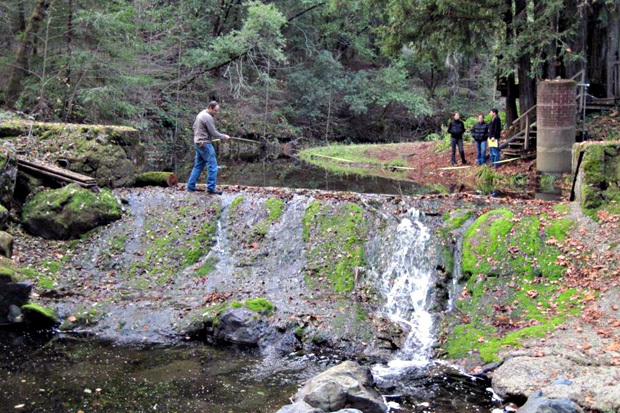 Mill Creek fish passage project featured on Climate.gov | Prunuske Chatham, Inc.
Derek Acomb of California Department of Fish and Wildlife measures the flashboard dam on Mill Creek prior to remediation. The dam was creating a near-total barrier for endangered coho salmon in the Russian River to access prime spawning habitat above. Photo Credit: Prunuske Chatham, Inc.
Climate.gov also provides lots of other interesting information, from stories about climate adaptation to tons of maps and datasets to resources for teaching about climate. This entry was posted in Fish passage, News.